The execution of meiotic nuclear divisions in S. cerevisiae is regulated by protein degradation mediated by the anaphase promoting complex/cyclosome (APC/C) ubiquitin ligase. The correct timing of APC/C activity is essential for normal chromosome segregation. During meiosis, the APC/C is activated by the association of either Cdc20p or the meiosis-specific factor Ama1p. Both Ama1p and Cdc20p are targeted for degradation as cells exit meiosis II with Cdc20p being destroyed by APC/CAma1. In this study we investigated how Ama1p is down regulated at the completion of meiosis. Here we show that Ama1p is a substrate of APC/CCdc20 but not APC/CCdh1 in meiotic cells. Cdc20p binds Ama1p in vivo and APC/CCdc20 ubiquitylates Ama1p in vitro. Ama1p ubiquitylation requires one of two degradation motifs, a D-box and a “KEN-box” like motif called GxEN. Finally, Ama1p degradation does not require its association with the APC/C via its conserved APC/C binding motifs (C-box and IR) and occurs simultaneously with APC/CAma1-mediated Cdc20p degradation. Unlike the cyclical nature of mitotic cell division, meiosis is a linear pathway leading to the production of quiescent spores. This raises the question of how the APC/C is reset prior to spore germination. This and a previous study revealed that Cdc20p and Ama1p direct each others degradation via APC/C-dependent degradation. These findings suggest a model that the APC/C is inactivated by mutual degradation of the activators. In addition, these results support a model in which Ama1p and Cdc20p relocate to the substrate address within the APC/C cavity prior to degradation. Meiosis is a specialized developmental program during which diploid nuclei undergo two consecutive meiotic divisions to produce haploid gametes. In the budding yeast, spore wall assembly follows the second meiotic nuclear division producing four haploid spores encased in a protective ascus . Similar to differentiation programs in higher eukaryotes, meiotic progression is regulated by the transient expression of genes that are either meiosis specific or expressed during both meiotic and mitotic divisions (reviewed in ). In addition, progression through the meiotic divisions is also driven by the degradation of key regulatory proteins directed by the highly conserved multi-complex ubiquitin ligase called the anaphase promoting complex/cyclosome (APC/C) (reviewed in [3–6]). During meiosis, the APC/C is sequentially activated by two of the three known Trp-Asp activator (WD40) proteins, Cdc20p (reviewed in [7, 8]), and Ama1p, the latter of which is only expressed during meiosis [9, 10]. The Cdc20p activated APC/C (written APC/CCdc20) mediates the degradation of several key regulatory proteins including Pds1p (securin) and the S-phase cyclin Clb5 during both meiosis I (MI) and meiosis II (MII) [8, 11]. Ama1p directs the ubiquitylation of the B-type cyclin Clb1p , Cdc20p  plus other unknown substrates  and co-ordinates exit from MII . APC/CAma1 also activates Smk1p, the meiotic MAP kinase required for spore wall morphogenesis  and is required for the early stages of spore wall assembly [11, 13, 15]. The third APC/C activator Cdh1p, is not required for normal meiosis . It has been well documented that APC/C activator proteins recognize substrates through two conserved degrons called the “Destruction-box” (D-box, DB) and “KEN box” that bind the WD40 domain in the activator [17, 18]. In addition, Doc1p (Apc10), a conserved component of the APC/C complex, also recognizes these degrons. These findings have lead to the model that substrates are recruited to the APC/C by binding to a bipartite substrate receptor composed of an activator protein and Doc1p ( and reviewed in ). During meiosis, Ama1p recognizes the D-box as well as variant of the KEN box called GxEN [10, 12] whereas Cdc20p recognizes the D-box and the KEN box [21, 22]. However, in Xenopus egg extracts the APC/C recognizes destruction motifs directly, in both a Cdc20p and Cdh1p-independent manner . Similarly, much is known about how the activator proteins bind to the APC/C . Structural analysis of Cdh1p has shown that a domain called the C-box interacts with Apc2p . Another domain termed the IR motif promotes the association of the activator with the TPR region of several APC/C subunits (Cdc16p, Cdc23p and Cdc27p) [25–28]. Doc1p (Apc10p), a subunit of the APC/C, also associates with the TPR subunits via its IR tail [29, 30]. During meiosis, both the C-box and IR domains are required for Ama1p and Cdc20p function . However, mutational analysis revealed that the C-box in Ama1p is significantly more important for meiotic progression than the IR motif . Similarly, during mitotic cell division, the IR box of Cdc20p is not required for function but contributes to APC/C dependent turnover [3, 6]. Although much is known about how the APC/C is activated during meiotic divisions (reviewed in ), considerably less is known about how this ligase is inactivated as cells complete meiotic program. This is an important question as APC/C inactivation at the end of meiosis may be critical to allow the spore to reenter the mitotic cell cycle. Our previous studies have shown that both Ama1p and Cdc20p are down regulated as cells exit from meiosis II [10, 12]. Furthermore, Cdc20p degradation is mediated by APC/CAma1 . In this report, we present evidence that Ama1p down regulation occurs via ubiquitin-mediated degradation directed by APC/CCdc20. Taken together, these results indicate that the cell has solved the problem of APC/C inactivation in a linear differentiation pathway by evolving a mutual degradation system for the activators. We have previously reported that Ama1p levels are reduced as cells complete the second meiotic division . As APC/C activators have been reported to be down-regulated by APC/C mediated proteolysis during mitotic and meiotic cell divisions (reviewed in [7, 8]), we first asked if the reduction in Ama1p levels was APC/C dependent. The meiotic levels of Ama1p-T7  were monitored in a strain harboring a temperature sensitive allele of CDC16 (cdc16-1), an essential component of the APC/C  that is required for meiosis . To inactivate Cdc16-1p, the cells were switched to the restrictive temperature (34.5°C) 4.5 h after meiotic entry as previously described [8, 10, 32]). As a control, Ama1p degradation was also examined in identically treated wild-type cells. Immunoblot analysis revealed that Ama1p-T7 levels remained elevated in the cdc16-1 strain compared to wild type (Figure 1A, quantitated in Figure 1B). Similar results were obtained when these experiments were repeated in a cdc20-1 strain (Figure 1A). Furthermore, these results are consistent with those obtained when Ama1p levels were monitored in a strain where Cdc20p was inactivated during meiosis by placing it under the control of CLB2 promoter . Taken together, these results indicate that APC/CCdc20 is required for the down regulation of Ama1p-T7 in meiosis. APC/C Cdc20 is required for Ama1 degradation during meiosis. A: Wild-type (RSY335), cdc20-1 (RSY809) and cdc16-1 strains (RSY954) harboring Ama1p-T7 (pKC3036) were induced to enter the meiosis and timepoints taken as indicated. Immunoblot analysis of immunoprecipitated protein extracts was conducted to detect Ama1p. Immunoblot analysis of Tub1p was used as a loading control. MI and MII indicate the approximate times of meiosis I (MI) and meiosis II (MII) as determined by DAPI analysis. All the strains were grown at 23°C and switched to 34.5°C (restrictive temperature for both cdc20-1 and cdc16-1 strains) after 4.5 h at 23°C in SPM. B: Quantitation of Ama1p-T7 from the experiments conducted in A. 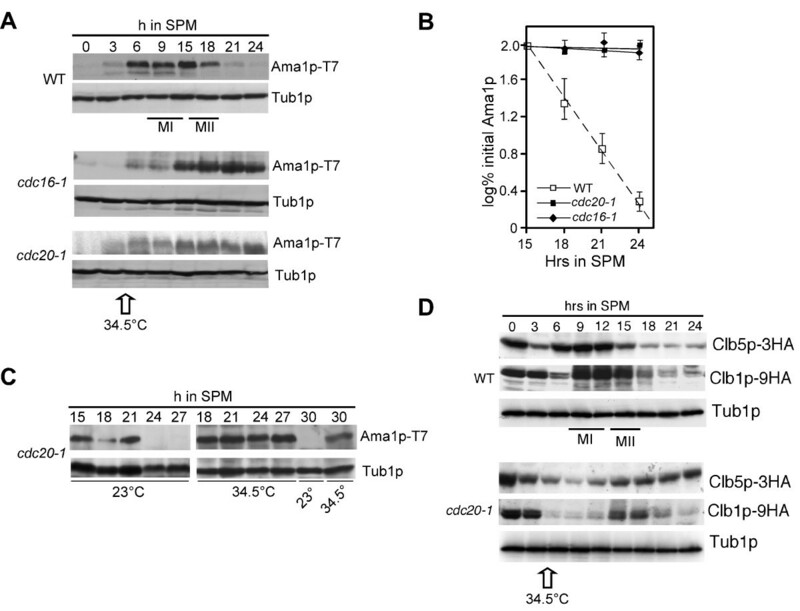 C: The levels of Ama1p-T7 were monitored in a cdc20-1 strain as in Panel A except that the cells were switched to the restrictive temperature 15 h after transfer to SPM. This panel also contains analysis of Ama1p-T7 stability at both temperatures, 30 h after entering sporulation. D: As in Panel A except that the wild type (RSY335) and cdc20-1 (RSY809) cultures harbored either Clb5p-3HA (pKC440) or Clb1p-9HA (pKC427) expression plasmids. 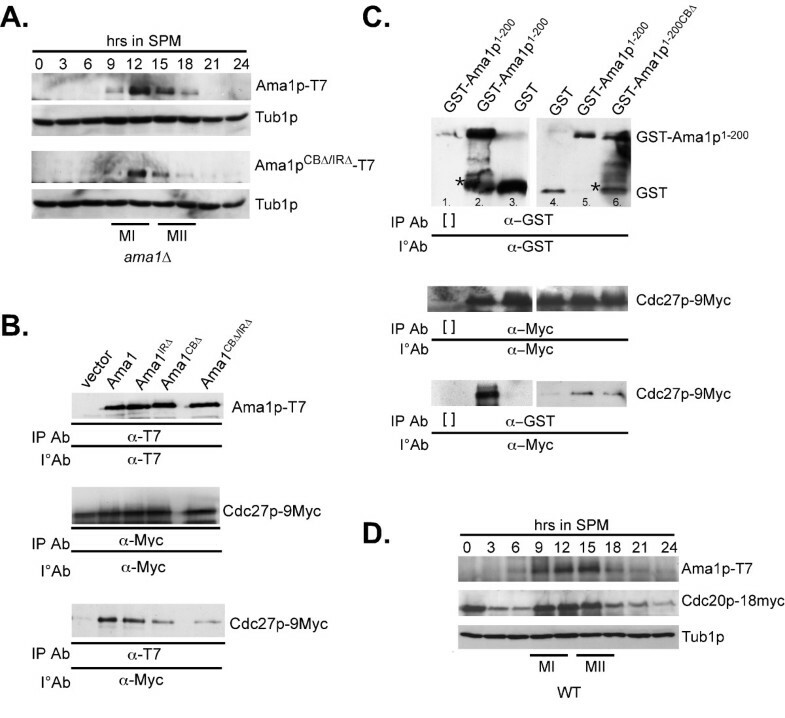 A caveat to this interpretation is that Ama1p-T7 stabilization in the cdc20-1 mutant is an indirect effect of the metaphase I arrest associated with this mutation . To address this issue, two approaches were taken. First, we examined Ama1p stability in a cdc20-1 mutant shifted to the restrictive temperature following meiosis II (15 h timepoint). These results show that Ama1p remains stable in the cdc20-1 strain at restrictive temperature even following 30 h in SPM (Figure 1C). To confirm that the cdc20-1 cells had completed the meiotic divisions by this timepoint, the transcription profiles of meiosis-specific genes were monitored using Northern blot analysis. By 15 h in SPM, maximal transcriptional accumulation of SPS4 was observed (Additional file 1) which is an indicator that the meiotic divisions are completing . Similarly, SPS100 mRNA induction, which correlates with spore wall formation , occurs 18 h after meiotic entry. For the second approach, we analyzed the meiotic degradation of Clb5p, a known substrate of APC/CCdc20 . Clb5p-HA levels were followed by immunoblot analysis in wild type and cdc20-1 cultures using the same temperature shift protocol as described in panel A. The results show that, compared to wild-type cells, Clb5p was stabilized following Cdc20p-1 inactivation (Figure 1D). In contrast, Clb1p, a known substrate of APC/CAma1 , is destroyed in cdc20-1 cells using the same conditions (Figure 1D). The slower induction kinetics observed for both cyclins is due to the fact that expression of early-middle, middle gene mRNAs is significantly reduced as well as delayed in this strain background . Taken together, these results support a model that APC/CCdc20 mediates the degradation of Ama1p as cells complete the meiosis and begin spore morphogenesis. To determine whether Cdh1p plays a role in Ama1p proteolysis during meiosis, Ama1p protein levels were monitored in cdh1∆ cells during meiosis. The results show that cdh1∆ cells both progress through meiosis (Additional file 2: Figure S2A, S2B and S2C) and degrade Ama1p with the same kinetics as wild type (Additional file 2: Figure S2D and see Tan et al. for Northern analysis). Interestingly, dissection of the resulting cdh1∆ tetrads revealed that, different to previously published results , cdh1∆ spores exhibit a significant reduction in their ability to form colonies (Additional file 2: Figure S2E). These results indicate that Cdh1p does not control Ama1p stability but does play a role in promoting spore viability. Ama1p contains two motifs, the destruction box (Db) and GxEN, that are recognized by APC/CCdc20 (reviewed in ), see Figure 2A). To determine if these sequences are required for Ama1p-T7 degradation, wild-type cells expressing either Ama1pDb1∆-T7 or Ama1pGxEN-T7 mutant proteins were induced to enter meiosis and their degradation profiles monitored by immunoblot analysis. These studies revealed no difference in decay kinetics for the single mutant derivatives compared to wild type (Figure 2B) indicating that individually the Db1 or GxEN motifs are not essential for Ama1p degradation. We have recently shown that the APC/CAma1 mediates Cdc20p degradation through more than one degron . To determine if Cdc20p also recognizes multiple Ama1p degrons, wild-type cells expressing a double Db1 and GxEN AMA1 derivative were examined as just described. The results (Figure 2B, quantified in Figure 2C) show that combining the GxEN and Db1 mutations protected Ama1p-T7 from degradation similar to that observed in cdc16-1 cells (compare to Figure 1A). 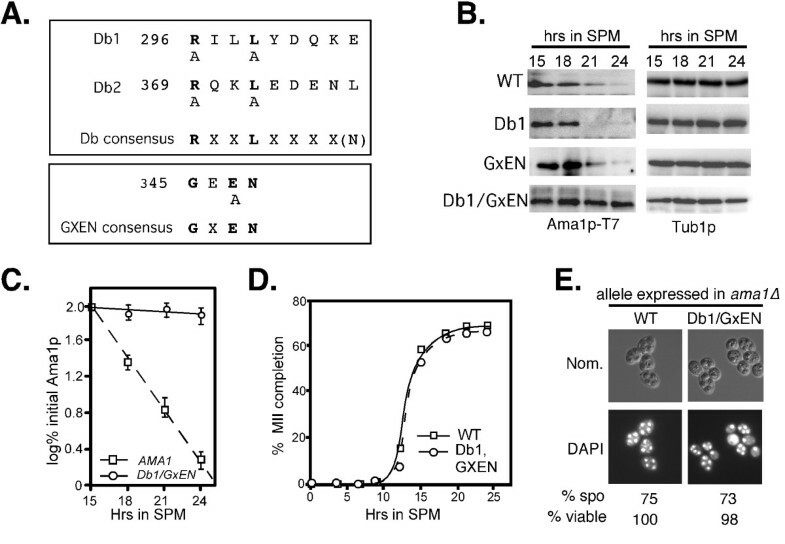 These results indicate that either Db1 or GxEN is sufficient to target Ama1p for degradation. No difference in the rate of meiotic progression (Figure 2D) or spore viability (Figure 2E) was noted indicating that stabilizing Ama1p did not have an adverse effect on the process. Identification of Ama1p degrons. A: Location of conserved APC/C degrons in Ama1p. The consensus sequences of destruction box and GXEN motifs are in bold face. The mutations described in the text are indicated below the consensus sequences. B: Both Db1 and GxEN degrons mediate Ama1p degradation during meiosis. Wild-type cells (RSY335) harboring plasmids expressing Ama1p-T7 or mutants as indicated were induced to enter meiosis and samples taken for immunoprecipitation and immunoblot analysis at the timepoints indicated. Tub1p levels were used as a loading control. C: Quantitation of the degradation kinetics of wild-type Ama1p-T7 and the Db1-GxEN double mutant obtained in Panel B. The mean ± s.e.m. is shown for each timepoint (n=3 independent experiments). D: The percent of tetra-nucleated cells during a meiotic timecourse in ama1∆ cells (RSY562) expressing either wild-type Ama1p (squares) or the DB1/GxEN double mutant (circles) plasmids. E: Fluorescence microscopy (1000X magnification) and Nomarski optics (Nom.) of DAPI Db1/GxEN expression plasmids. The percent viability of dissected spores (n=40, WT normalized to 100%) is given below. To further confirm that APC/CCdc20 mediates the degradation of Ama1p, in vitro ubiquitylation assays were performed (see Methods for details). As Ama1p is an activator of the APC/C , the assays were performed with an in vitro transcription coupled translation produced 35-S labeled Ama1p derivative deleted for its two APC/C binding domains (C-box and IR motif). These motifs are required for Ama1p function  and their mutation reduces its association with the APC/C (see Figure 3B and C). To ensure that the added Cdc20p is the only activator in the reaction, the APC/C core complex was purified from mitotically dividing cdh1∆ cells. Furthermore, Mnd2p (Apc15p) was not present in the extracts as it inhibits meiotic APC/C activity . As predicted from the in vivo studies, Ama1pCB∆/IR∆ is ubiquitylated by APC/CCdc20 in vitro (Figure 4A, lanes 1, 2 and 3 and see Additional file 3 for input), but also that Cdc20p is required for this event (Figure 4A – lane 12). Ama1p binding to the APC/C is not required for its degradation. A: ama1∆ strain (RSY562) harboring either Ama1p-T7 (pKC3036) or Ama1pCB∆/IR∆-T7 (pKC3048) expression plasmids were induced to enter meiosis and timepoints taken as indicated. Immunoprecipitation and immunoblot analysis of protein extracts was conducted to detect Ama1p-T7 and Ama1pCB∆/IR∆-T7. Immunoblot analysis of Tub1p was used as a loading control. B: Ama1p deleted for the CB and IR regions shows reduced binding to Cdc23p-9myc during meiosis. The Cdc27-9myc expressing strain (KCY328) harboring either the vector control, Ama1p-T7 or mutant versions of Ama1p as indicated were induced to enter meiosis and the cells harvested 12 h following transfer to SPM when both CDC27 and AMA1 are expressed. Immunoprecipitation and immunoblot analysis was conducted to detect the presence of both proteins. The top and middle panels control for protein expression (input). The bottom panel assays co-immunoprecipitation. C: The amino-terminal region (codons 1-200) of Ama1p is sufficient for APC/C association. The Cdc27-9myc expressing strain RSY1337 harboring either GST (lanes 3 and 4), GST-Ama1p1-200 (lanes 1, 2 and 5) or GST-Ama1p1-200CB∆ (lane 6) expression plasmids were grown in raffinose/galactose medium to induce the fusion genes. Immunoprecipitation and immunoblot analysis was conducted to detect the presence of both proteins. The top and middle panels control for protein expression (input). The bottom panel assays co-immunoprecipitation. represents the no antibody mock immunoprecipitation. The asterisk represents a background band. D: A wild-type strain (RSY750) harboring integrated AMA1-3HA and CDC20-18myc alleles were induced to enter meiosis and timepoints taken as indicated. Immunoblot analysis of immunoprecipitated protein extracts was conducted to detect Ama1p-3HA and Cdc20p-18myc. Immunoblot analysis of Tub1p was used as a loading control. In all experiments, the approximate times of meiosis I (MI) and meiosis II (MII) were determined by DAPI analysis. Ama1p ubiquitylation by APC/C Cdc20 A: in vitro ubiquitylation of Ama1p and mutant derivatives as indicated using the APC/C prepared from mnd2∆ cdh1∆ CDC16 ::TAP strain (RSY1381, see Methods for details). In vitro transcription coupled translation produced Cdc20p was added to all extracts except for lane 12. 35S labeled Ama1p harboring the following mutations:- lanes 1, 2 and 3 CB∆/IR∆, lanes 4, 5 and 6 CB∆/IR∆/GxEN, lane 7 CB∆/IR∆/GxEN/Db1/Db2, lanes 8 and 9 CB∆/IR∆/Db1 and lanes 10,11 and 12 CB∆/IR∆/GxEN/Db1 was prepared by in vitro transcription coupled translation. B: Doc1p is not required for APC/CCdc20 mediated ubiquitylation of Ama1p. In vitro ubiquitylation assays on Ama1pCB∆/IR∆ using APC/C purified from mnd2∆, cdh1∆ CDC16::TAP (RSY1381, lanes 1, 2 and 3) or mnd2∆ cdh1∆ doc1∆ CDC16::TAP (RSY1748 lanes 4, 5 and 6). Time after the addition of Cdc20p to the reactions (minutes at 37°C) is given. The in vivo stability assays just described (Figure 2) indicated that either Db1 or the GxEN motif is sufficient to induce Ama1p degradation. Consistent with this result, deletion of either of these motifs in the Ama1pCB/IR mutant still allowed ubiquitylation to occur (Figure 4A, lanes 4-6 for GxEN, 8 and 9 for Db1). However, Ama1p mutated for both Db1 and GxEN was still ubiquitylated in vitro by APC/CCdc20 (Figure 4A, lanes 10 and 11). This result was unexpected as this mutant is not targeted for degradation in vivo (Figure 2B). These results led us to test if the second destruction box degron (Db2) on Ama1p can mediate Cdc20p-dependent in vitro ubiquitylation. This was indeed the case as the mutation of Db2, in addition to Db1 and GxEN, rendered Ama1p resistant to APC/CCdc20-dependent ubiquitylation (Figure 4A, lane7). Taken together, these results reveal that Cdc20p can recognize degrons Db1, Db2 and GxEN using in vitro assays. However, Db2 is not recognized by Cdc20p as a degron in vivo during meiosis. The APC/C core component Doc1p forms part of the bipartite degron receptor in yeast [19, 25, 30]. Therefore, we addressed whether Doc1p is required for APC/CCd20 mediated ubiquitylation of Ama1p. The ubiquitylation assays were repeated using Ama1pC-Box∆/IR∆ as the substrate and APC/C was prepared from cdh1∆ mnd2∆ doc1∆ cells. The results show a slight qualitative reduction in Ama1pC-Box∆/IR∆ ubiquitylation when the APC/C was prepared from cdh1∆ mnd2∆ doc1∆ extracts compared to those prepared from a cdh1∆ mnd2∆ strain (Figure 4B, compare lane 3 to 6). These results suggest that Doc1p is dispensable for Ama1p ubiquitylation in vitro. Significant structural analysis of the APC/C and its substrates has found two distinct locations within the cavity of the core APC/C complex that are occupied by the activator protein and the substrate. Our findings that Ama1p is both an activator and a substrate of the APC/C raised the question of its location within the APC/C cavity before it was destroyed. To address this question, we took advantage of the observation that the conserved APC/C binding domains of Ama1p (C-box and IR motif) are required for APC/CAma1 function and normal association with the APC/C . Therefore, we reasoned that if Ama1p was destroyed while in its activator binding pocket, then disruption of this interaction should protect the protein from degradation. Immunoblot blot analysis of ama1∆ cells harboring either wild-type Ama1p or Ama1pCB∆/IR∆-T7 during meiosis revealed no differences in the kinetic profile of Ama1p accumulation and degradation (Figure 3A). These results indicate that Ama1p association to the APC/C via the CB and IR motifs is not a pre-requisite for its degradation. These results also suggest that the majority of Ama1p degradation is not mediated by auto-ubiquitylation as Ama1pCB∆/IR∆-T7 is still degraded in the absence of a functional copy of Ama1p. To further address this question, co-immunoprecipitation performed assays were performed between Cdc27p-9myc and either Ama1p, Ama1pCB∆-T7, Ama1pIR∆-T7, or Ama1pCB∆/IR∆-T7. The results showed that Ama1pCB∆-T7 and Ama1pCB∆/IR∆-T7, which complemented an ama1∆ allele with 11 and <0.5% sporulation efficiency, respectively , exhibited reduced Cdc27p-9myc binding (Figure 3B). Conversely, Ama1pIR∆-T7, which exhibited only slight reduction in activity , binds Cdc27p-9myc with similar affinity as wild-type Ama1p. These results were somewhat unexpected as deleting the IR and Cbox motifs in Cdh1p eliminates its ability to bind the APC/C . In addition, these results suggest the presence of additional APC/C binding motif(s) in Ama1p. Consistent with this possibility, we found that a GST-Ama1p fusion construct containing the divergent amino third of Ama1p (codons 1-200) , can co-immunoprecipitate with Cdc27p-9myc (Figure 3C) whereas GST alone cannot (lanes 3 and 4). Again, we only observe a slight reduction in Cdc27p-9myc association when a GST-Ama1p1-200CB∆ fusion construct (Figure 3C, lane 6). These results indicate that the amino-terminal region of Ama1p is sufficient for APC/C association and contains an uncharacterized APC/C binding motif(s). We have previously demonstrated that APC/CAma1 directs the degradation of meiotic Cdc20p . Our results here indicate that in a reciprocal fashion APC/CCdc20 also mediates the degradation of Ama1p as cells exit meiosis II. If Ama1p and Cdc20p are required for each other’s degradation, one prediction of this model is that their degradation kinetics should be similar. To test this hypothesis, a strain was constructed harboring integrated alleles of CDC20- 18myc and AMA1-3HA under the control of their own promoters. Our previous studies found that Ama1p-3HA is both functional and has the same degradation kinetics as Ama1p-T7 . A meiotic timecourse was conducted and Cdc20p-18myc and Ama1p-3HA expression profiles were determined by immunoblot blot analysis. These studies revealed that the accumulation and subsequent degradation of both proteins were remarkably similar (Figure 3D). These results are consistent with the model that Ama1p and Cdc20p simultaneously mediate each other’s degradation, thus terminating APC/C activity as the cells complete meiosis and form quiescent spores. The APC/C ubiquitin ligase is required for the meiotic nuclear divisions in yeast. Previous studies have found that the two APC/C activators in meiosis, Ama1p and Cdc20p, are down regulated as cells complete meiosis II. Cdc20p is targeted for degradation by APC/CAma1 . In this study, we demonstrate that the reverse is true in that APC/CCdc20 is required for Ama1p degradation. Using a combination of stability assays and in vitro ubiquitylation experiments, we show that Cdc20p, but not Cdh1p, targets Ama1p through either one of two degrons, Db1 and GxEN. We also provide evidence to support a model in which degradation of Ama1p does not occur by auto-ubiquitylation as the non-functional Ama1pCB∆/IR∆ mutant is still degraded with wild-type kinetics in ama1∆ cells. Finally, we show that the degradation of Ama1p and Cdc20p at MII exit occurs with similar kinetics. Taken together, these results suggest a model in which the mutually dependent degradation of Ama1p and Cdc20p terminates APC/C ubiquitin ligase activity at the completion of meiotic development in yeast. Understanding how the APC/C is regulated during both mitotic and meiotic divisions is important as unscheduled APC/C activity can lead to mis-segregated chromosomes and aneuploid gametes. Many studies have been devoted dissecting the precise mechanisms by which the APC/C is both activated and inactivated in mitotic cells (reviewed in ). These studies revealed that the complete inactivation of the APC/C late in G1 is driven by inhibition of Cdc20p and Cdh1p. This system not only resets the APC/C clock, which is critical for maintaining ploidy as it ensures that the pre-replication complex is assembled prior to S phase (reviewed in ). Cdh1p inactivation is achieved by phosphorylation (reviewed in ). However, Cdc20p regulation is more complex. Initially, it was shown that Cdc20p is inactivated by transcriptional oscillation and turnover by APC/CCdh1 (reviewed in ). However, recently it was shown that APC/CCdh1 only partially contributes to Cdc20p degradation during anaphase . Instead, Cdc20p degradation is predominantly mediated by an auto-ubiquitylation event [6, 39]. Ama1p degradation does not seem to take the same course as the non-functional CB∆/IR∆ is still degraded in ama1∆ cells (Figure 4A). Even less is known about how the APC/C is inactivated as cells exit meiosis II. This is an important question as APC/C inactivation is important for normal embryonic development in Drosophila . Similarly, we find that the two APC/C activators are degraded late in meiotic development. However, we find no significant effect on meiosis II fidelity or overall spore viability when either Cdc20p or Ama1p degradation is inhibited ( and Figure 2). These observations suggest that either APC/C inactivation is not required for the normal execution of meiosis and spore formation or that this ubiquitin ligase is disabled by redundant systems. In support of the latter possibility, several mechanisms are known to control APC/C function including inhibitory phosphorylation [41–44], APC/C specific inhibitors [45–52], or removal of the activator from the APC/C complex . The roles these mechanisms play as cells exit the meiotic program are not well understood. However, in Xenopus and S. pombe, inhibitors of meiotic Cdc20p have been identified [54, 55]. Extensive studies have been devoted to understanding the molecular mechanisms of APC/C activator binding and substrate recognition (reviewed in ). Currently, two non-mutually exclusive models have been proposed. In the bi-partite model (outlined in model A, Figure 5), the substrate binds to both the activator and to Doc1p in the inner cavity of the APC/C. This dual association increases the affinity of the substrate enzyme complex [19, 24, 25, 30]. However, Doc1p it is not essential for substrate binding in yeast  and its contribution to meiosis is not well documented. In the second model, coined the allosteric model, binding of the activators to the APC/C induces a conformational change which leads to substrate recognition . 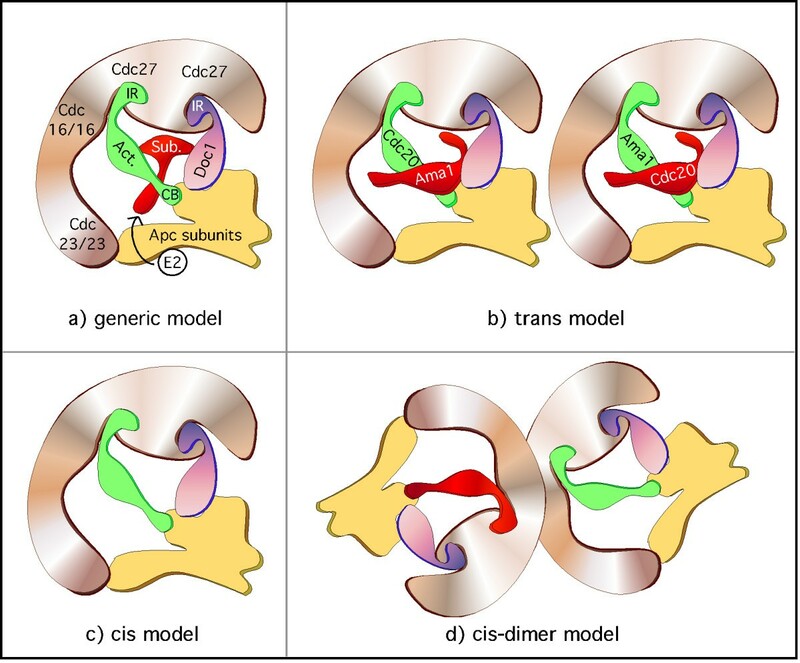 Currently, the bipartite model is favored but the two models can co-exist as the bi-partite model can still accommodate activator association promoting conformational changes. Possible mechanisms for mutually dependent degradation of Cdc20p and Ama1p. A : Generic APC/C model derived from genetic, biochemical and structural information (adapted from models presented in [19, 24, 58, 59]); both the activator (green) and the substrate (red) are located in the inner cavity of the multi-subunit complex. The substrate is represented as binding between the interface of the activator (via D-box or GxEN) and Doc1p (purple, via D-box ). The “platform” (Apc1p, Apc4p and Apc5p) and Apc2p are shown in blue and the “arc lamp” (Cdc16p, Cdc23p and Cdc27p) in light brown. The activator is connected to the arc lamp (via Cdc27p) and to the platform (via Apc2p) by its IR and C-box motifs respectively . Doc1p is also connected to Cdc27p via its IR motif and to Apc2p (reviewed in [3, 5]). E2 shuttles into the complex during the course of a polyubiquitylation reaction. B: Trans-model. Ama1p and Cdc20p are destroyed when they are released from the activator binding position and move into the substrate position. C: Cis-model. Ama1p remains in the activator position and is destroyed by auto-ubiquitylation. D: Cis-dimer model. Ama1p and Cdc20p remain in the activator position. They are destroyed when they come in contact with another APC/C subunit bearing the reciprocal activator. That being said, how does Ama1p fit into these models when it becomes a substrate of the APC/C? Recently, work by Foe et al. has shed some light on this question. This group demonstrated that the majority of the late mitotic turnover of Cdc20p occurs while Cdc20p is bound as an activator and is driven by auto-ubiquitylation (see model in Figure 5C, cis-model). Consistent with this model, Cdc20pIR∆ mutants show increased steady state levels and reduced auto-ubiquitylation [3, 6]. In contrast, we present evidence that Ama1p degradation is independent of APC/C binding via the CB and/or IR motifs (see Figures 4 and 3A). As the CB and IR motifs associate with Cdc27p/Cdc23p and Apc2p, respectively , our data support a model (outlined in Figure 5B, trans-model) in which Ama1p disassociates from Cdc27/23 and Apc2 before it is recognized as a substrate by APC/CCdc20. Thus, the residual association that we observed between Cdc27p and Ama1pCB∆/IR∆ (Figure 3B and C) could be due to Ama1p associating with the APC/C in the substrate location. This suggests a model in which C-box and IR motifs anchor Ama1p in the activator position but in their absence, Ama1p switches into the substrate position binding the APC/C via as yet uncharacterized motifs. The mechanism that triggers this disassociation remains unknown but recently it has been shown that phosphorylation of Cdc20p prevents its CB-dependent activation of the APC/C in Xenopus egg extracts . Lastly a “cis-dimer” model (Figure 5D) where Ama1p remains in the activator position and is degraded when an APC/CCdc20 complex forms a dimer partner is also possible. This model is not favored as although yeast APC/C exist as dimers, recent work has shown that the monomers associate along the backbone of the “arc lamp” thus positioning the substrate binding sites in opposite directions [19, 60]. Finally, the observation that Cdc20p and Ama1p both regulate each other leads to the mechanistic question of which protein is the last one to be degraded. Analysis of both proteins under the control of their own promoters in a single meiotic timecourse experiment showed that they were down regulated at the same time. These results suggest that it may not be critical as to which activated APC/C molecule is the last one. To conclude, these data presented here allow us to propose a model of how APC/C activators are recognized as substrates of the APC/C during meiosis. It remains to be seen if this model is conserved during gametogenesis in other systems. The strains used in this study (Table 1) are isogenic to RSY335  and are derived from an SK1 background . The only exception to this is RSY1337 that is isogenic a W303a-related strain RSY10 . The Cdc27-9myc::LEU2 strains (KCY328 and RSY1337) were made by inserting CDC27-9myc tagged allele (P. Hieter) into RSY335 and RSY10 respectively. The mnd2∆:: KANMX cdh1∆::LEU2 CDC16-TAP strain (KCY1381) was made as follows. First, the TAP cassette was inserted into the carboxyl terminus of CDC16 by recombining PCR products from pFA6a-TAP-kanMX6 (D. Barford) to create KCY456. Next, the mnd2∆:: KANMX haploid (KCY419) was created in the opposite mating type using the gene disruption . These two haploids were then mated and an mnd2∆::KAN CDC16::TAP:: KANMX haploid (RSY1248) spore clone was identified that showed 2:2 distribution of the KANMX allele following tetrad analysis. CDH1 was deleted from RSY1248 using pWS176 (W. Seufert) to create RSY1381. Finally DOC1 was deleted from this strain using standard gene disruption techniques  to create RSY1748. The temperature-sensitive cdc20-1 strain (RSY809) has been previously described  . The temperature-sensitive cdc16-1 strain RSY954 was made by back crossing H20c1a5  into the RSY335 strain background eight times. The strain harboring integrated epitope-tagged alleles of both AMA1 and CDC20 (RSY750) was made by using integrating plasmids containing functional AMA1-3HA  and CDC20-18myc (from W. Zachariae), respectively. Tables 2 and 3 list the oligonucleotides and plasmids used in this study, respectively. Details of plasmid constructions are available on request. In brief, all the AMA1-T7 tagged plasmids were derived from pKC3036 . The Ama1p expressing plasmids used for ubiquitylation assays were derived from pME67 (D. Morgan). The Cdc20p plasmid used for ubiquitylation assays was pME41 (D. Morgan). The CLB5-3HA plasmid (pKC440) was made by cloning an Xho1-Cla 1 fragment containing Clb5-3HA (from C. Wittenberg) under the control of its own promotor and terminator into Ycplac222. The Clb1-9HA plasmid was made by first cloning a Pst 1-Pst 1 fragment from a CLB1/CLB6 contig (from C. Wittenburg) into pRS315 and then inserting 9 repeats of the HA epitope just upstream of the stop codon to create pKC427. The galactose inducible GST-Ama11-200 fusion construct (pKC3113) has been previously described . In brief, AMA1 was introduced into pEG[KT], which contains GST under the control of the galactose promotor (a gift from M. Solomon). Site directed mutagenesis was used to delete the C-box in this construct to make pKC3071. All mutations were introduced using the Quikchange Site-directed Mutagenesis (SDM) Kit (Stratagene) according to the manufacturer’s protocol. All introduced mutations were verified by DNA sequencing (MWG/Operon). *All strains, except RSY1337 are isogenic to RSY335. All strains are diploids and all alleles are homozygous unless indicated. * CYC1 promoter driven by GAL1 UAS. Growth and sporulation conditions were accomplished as previously described . To permit cdc20-1 and cdc16-1 cultures to exit mitosis and enter the meiotic program, these cells were maintained at 23°C following transfer to sporulation medium for the amount of time indicated in the text before switching to the restrictive temperature (water bath). Quantitation of meiosis I and II was achieved by analyzing 4’, 6-diamidino-2-phenylindole (DAPI) stained cells as described . A Nikon E800 fluorescence microscope was used for all experiments at a final magnification of 1000X. At least 200 cells were counted per timepoint. For the experiments using the galactose inducible GST expression constructs (Figure 4C), cells were grown to 1 × 107 cells/ml in 2% raffinose, 2% galactose medium as previously described . Northern blot analysis was executed as previously described . Protein extracts for co-immunoprecipitation and Western blot analyses (referred to as Immunoblot in text) were prepared as described . Immunoblot analysis and co-immunoprecipitation experiments were conducted with 100 μg and 1 mg of soluble protein, respectively. Immunoblot signals were detected using goat anti-mouse secondary antibodies conjugated to alkaline phosphatase (Sigma) and the CDP-Star chemiluminescence kit (Tropix, Bedford, MA). Quantitation of Ama1p immunoblot signals from the mem brane was performed with an Image Station 4000R (Kodak Inc.) using Molecular Imaging Software (4.0.5) and standardized to tubulin. For all comparative immunoblot analyses, the membranes were treated with the same probe at the same time and the resulting signals were developed to the same extent. The in vitro ubiquitylation assays were performed as previously described [32, 70]. In brief, the APC/C complex was purified from yeast extracts utilizing tandem affinity purification (TAP) tagged Cdc16p, a core component of this ubiquitin ligase. The ligase was incubated with E. coli produced ubiquitin conjugating enzyme (made from His6-Ubc4p (from M. Solomon) and in vitro transcription/translation produced Cdc20p. The Ama1p substrates were synthesized by in vitro transcription/translation (Promega) but in the presence of 35S-methionine. As previously described , 1 μl of the substrate was used per reaction (see Additional file 3 for input). The ubiquitylation reactions were conducted for the times indicated with fixed Cdc20p amounts (2.5 μl). The reactions were stopped by addition of 2X sample buffer and separated by SDS PAGE. The gels were fixed, soaked in Amplify® (Amersham Biosciences), then dried and subjected to autoradiography. We thank D. Bradford, P. Hieter, D. Morgan, W. Seufert, M. Solomon, C. Wittenberg and W. Zachariae for plasmids. This work was supported by ACS grant # CCG106162 to K. F. C. and by Public Health Service grant #’s CA-099003 and GM086788 from the National Institutes of Health, U.S.A. to R. S.
GT performed the experiments outlined in Figure 1A, B and C, 2 and 3A and B. RL performed the experiments outlined in Figure 4. MM performed the experiment in Figure 1D and 3C. KFC and RS wrote the manuscript. All authors read and approved the final manuscript.